At 0526, the Beverly Fire Department was dispatched to a report of a fire on the roof at North Shore Volkswagen at 128 Park St. Captain Russell Halloran, the Officer in Charge, turned on to Park St and witness heavy fire and smoke coming from the building and immediately requested a second alarm. Crews from Truck 1, and Engine 5 immediately stretched hoses into the showroom portion of the building in an effort to knock down fire in the building, but heavy heat and intensifying fire conditions drove firefighters out of the building. As firefighters from Wenham, Manchester, Peabody, Danvers and Salem arrived at the scene, crews were able to force additional exterior doors and get hoses in place to stop the rapid progression of fire. Wenham Firefighters opened holes in the roof to give smoke and heat a place to get out rather than travel the length of the building. The buildings layout kept the bulk of the fire in a loft where fire crews had a difficult time getting water on it. Ultimately, crews were able to get water into the loft and get the fire knocked down before it was able to spread further down the building where nearly 1,000 gallons of waste oil was stored. By 0715, crews from outside communities were being released from the scene. Beverly Firefighters will remain on scene throughout the day. With the heavy flames knocked down, firefighters were able to enter the building, dig out hidden fires and assess damage. The heaviest of the fire damage occurred between the showroom and the shops storage area. There were several cars in the showroom that sustained moderate smoke and some heat damage and all of the offices in that area were destroyed. The entire loft area as well as parts storage area sustained heavy heat and water damage that resulted in the partial collapse of several load bearing structural members. Two vehicles in the shop were damaged including one that fire crews found fully involved on a lift seven feet in the air. The structure is a total loss with severe damage to structural elements exposed to the fire. According to the 2010 assessment, the building is valued at just over $400,000. Firefighters have estimated the contents loss at more than $500,000. One major concern was the chemicals used at an auto repair facility. The Massachusetts Department of Environmental Protection was notified of the incident. The greatest concern was for waste oils and fuels which appear to have been contained. No injuries were sustained by firefighters or civilians. The fire closed Park St until approximately 10 am. Fire Investigators from the Beverly Fire Department, Beverly Police Department and a Trooper from the Office of the State Fire Marshall are on scene investigating the cause of the fire. No one was in the building at the time the fire was reported, but property owners were on scene throughout the morning. Peabody, Wenham, Danvers, Manchester by the sea, Salem and Rehab 5 assisted at the scene while Hamilton, Swampscott, and Topsfield covered Beverly�s stations. At 1049, the Beverly Fire Department received a report of a building fire at 302 Manor Rd. Fire Alarm Operator Jack Smallwood immediately dispatched Truck 1, Truck 2, Engine 3 and Car 2. Due to the location and nature of the report, Danvers Engine 3 was also requested at the time of dispatch. Lt. Robert Atherton, FF Curtis Hall and FF. Steven White were the first to arrive at the scene finding heavy fire at the front of the building extending from the first floor to the roof. FF. Hall immediately put water on the visible fire while Lt. Atherton entered the building to check for fire extension and ensure all occupants were out. Inside the building, Lt. Atherton encountered heavy heat and fire in units 2b and 3b and a second line was stretched into the building to attack the fire. All of the occupants had been evacuated from the building prior to the arrival of firefighters. Additional firefighters from Truck 1 and Engine 3 arrived and began assisting Truck 2�s crew inside the building where ceilings and a portion of the roof had already begun to collapse. As additional crews from Salem, Danvers, Hamilton, Manchester and Wenham arrived the firefighters were able to get the upper hand on the fire and prevent it from spreading to attached buildings. A significant challenge to fire crews was the fact that 302 Manor road is comprised of 12 apartments sandwiched between two other attached buildings. In the attic area, fire stops were plywood and the roof was supported by wooden trusses that fail quickly under heavy fire conditions. During this incident, two of the trusses failed opening an eight by twelve foot hole in the roof but firefighters were able to stop the spread of fire before the plywood walls separating the attic spaces were significantly breached. Damage to the attached buildings was minimized. The entire structure which includes 301-304 Manor Rd consists of 26 units. Power to all 26 units was shut down and it has not yet been determined if the residents will be able to return to their apartments to stay tonight. The American Red Cross did respond to the scene to provide the approximately 50 residents assistance as needed. Fire Investigators Lt. Robert Bergeron, Eric Fowler and Mark Brewer have determined the cause of the fire to be careless disposal of smoking materials. The fire began on a second floor deck and extended up through the roof and down to the exterior of the first floor apartment. The second and third floor apartments in the front left of the building, 302 2b and 3b, suffered the most serious fire damage and are a complete loss. Two pet cats and a bird succumbed to the heat and smoke in the 3b. First floor apartments and apartments on either side of 2b and 3b suffered damage from firefighters chasing hidden fires. The building is valued at roughly $1,500,000 and damages are estimated at approximately $375,000. An additional $80,000 is estimated to have been lost in building contents. One firefighter suffered a minor laceration to his finger during interior operations and a civilian bystander was seen by paramedics after suffering an unknown ailment. Truck 2, the initial responding company cleared the scene at 1347. Three firefighters remain at the scene making sure there are no hidden hot spots. Diver Team coordinator Robert Atherton (green shirt) briefs divers Arthur Fitzpatrick and Dean Julien before entering the water for the first dive of the day. The divers successfully located and made the first directional mark on the cable. The Beverly Fire Department Dive team used its monthly drill to search for and mark out submersed communication cables in the area of the construction at the Harbor Center. Three teams of divers spent roughly four hours scouring the harbor floor looking for cables that were buried up to two feet in the silty bottom. The effort to mark the cables was undertaken in order to prevent workers from severing them as construction in the harbor waters continued. The cables are fiber optic communication wires that provide a link along the north shore. The Beverly Fire Department Dive Rescue Team conducts a training drill every month. Drills that entail specific missions, such as this one, are particularly beneficial as the team is actually conducting search operations in waters where they are likely to dive. <?xml:namespace prefix = o ns = "urn:schemas-microsoft-com:office:office" />At 0137 on May 3, 2010 the Beverly Fire Department responded to a report of a fire in an apartment at 132 Dodge St. Upon arrival, Lt. Arthur Fitzpatrick, Firefighter Patrick Brady and Firefighter Joseph Tucker found heavy smoke and reported a working fire. Beverly Police Officers had already been through the building evacuating all of the occupants. Inside the building, crews entered apartment 2 where the fire was reported. As they made their way up interior stairs within the apartment they encountered extremely dense smoke and heat conditions. After a brief search, the seat of the fire was found in the apartment�s third floor bedroom. While the crew of Engine 5 worked inside, Captain Paul Labelle and the crew of Truck 1 climbed to the roof of the building and began cutting a hole to ventilate the smoke and heat. Firefighters David Genest and Albert Petronzio used a chainsaw to cut the whole directly above the fire. While on the roof, Truck 1�s crew was also able to check the attic of the three story brick and wood structure for fire extension. With crews from Beverly, Wenham and Hamilton working inside the structure, the fire was knocked down quickly and the heaviest fire damage was confined to the second floor of apartment 2.The first floor of the apartment suffered damage by smoke and water. The third floor common hallway suffered moderate smoke damage, while the second floor common hallway suffered only minor water damage.Due to the size of the building, crews spent approximately two hours using fans to blow smoke out of each individual apartment to make it safe for occupants to reenter. Although there were no fire injuries reported, one person from an adjacent apartment was interviewed by Paramedics after reporting that she may have been having carbon monoxide related symptoms. The Wenham crew did rescue one cat that was inside the structure. Fire Investigators Robert Bergeron and Jeff Sirois investigated the fire that caused roughly $225,000 in damages to the building and contents. Their investigation led them several to small electrical cords that were plugged into one outlet immediately adjacent to the bed. A malfunction of one of the cords caused enough heat to ignite the bed linen which then spread to the mattress and other combustibles. When the two occupants climbed the stairs to find smoke and fire, one made an attempt to extinguish the fire, while another called 911. Once the occupants realized that the fire was too large to be extinguished without firefighters, they evacuated the building. 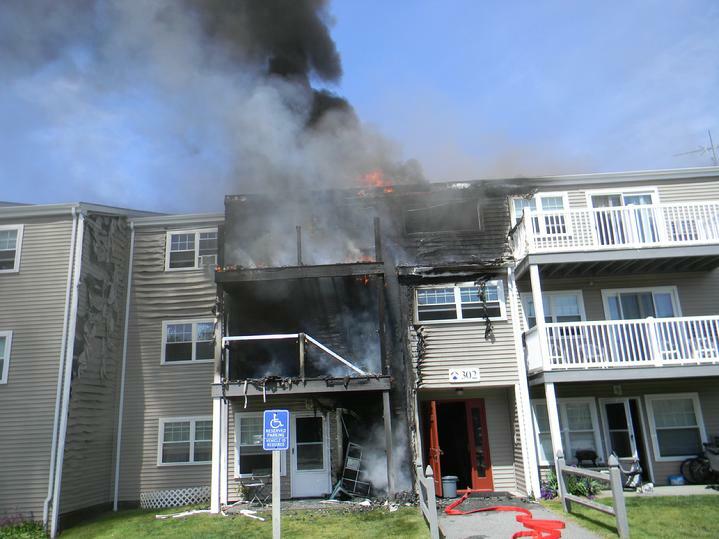 Only the two residents of the affected apartment were displaced by the fire. The remaining nine apartments were declared safe by Fire Department and Building Inspectional Services Personnel after the fire alarm panel was restored and some damaged electrical circuits were isolated. A total of 15 occupants were reported to occupy the apartments in the upper floors. While Wenham, Hamilton, and Roger Baker�s Rehab 5 assisted at the scene, crews from Salem, Danvers and Manchester covered Beverly�s Stations. All fire suppression crews were clear of the scene at 0443.